Here in Suffolk you will find some great Golf courses - some challenging links courses, some deceptively picturesque and some slightly magical. 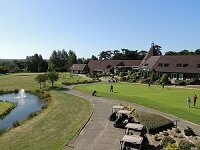 Considered to be the finest venue of its kind in East Anglia, The Stoke by Nayland Hotel, Golf and Spa offers two 18-hole golf courses combined with luxury hotel rooms, fine dining and Spa facilities, so it's ideal for golf breaks or golf weekends. 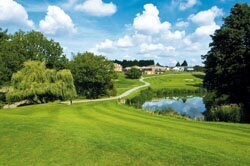 See The Stoke by Nayland Hotel, Golf and Spa and book now! Ufford Park Hotel, Golf & Spa, Woodbridge not only boasts a golf course seen on Sky TV, but offers events, Spa packages, and birdwatching tours around the surrounding area. Ufford Park's challenging 18 hole, Par 71 golf course plays host to prestigious tournaments such as the PGA EuroPro Tour, as televised on Sky Sports. In addition there is a two tier luxury driving range, 4,000 square feet American Golf Shop and Doctorgolf Teaching Academy. These facilities are all available to Ufford Park's Hotel guests. Set in 120 acres of historic parkland overlooking the Deben valley, this modern hotel has 87 comfortably appointed en-suite bedrooms, many of which have balconies. The Hotel also has a Spa and swimming pool, so check out their facilities now! Why not combine a little golf with another activity? To help you explore, Ufford Park offers nature and events throughout the year, including birdwatching. Click on their link above for more info on what they offer, and details of forthcoming courses at Ufford Park. 18 holes of PGA golf await you at Hintlesham Hall Hotel. Golf Packages are available from this Elizabethan Manor House which has a magnificent Golf Course adjoining the Hotel. What makes Hintlesham Hall a fantastic golfing retreat is the combination of luxury accommodation, a first class gold course, excellent cuisine, a leisure centre and Spa facilities. Find out more by clicking on the link for Hintlesham Hall above. Please tell us about your favourite Suffolk Golf Hotel by Sending Us an Email.